Yelp Advertising Review 2019: Is Advertising With Yelp Worth It? Yelp is clearly ramping up their sales teams as a lot of our clients have been getting calls from sales reps. I can’t even visit the local Victoria BC subreddit without seeing this Yelp banner ad thanks to their digital advertising. They’re most likely ramping up their sales and advertising efforts because they didn’t meet their sales estimates last year. 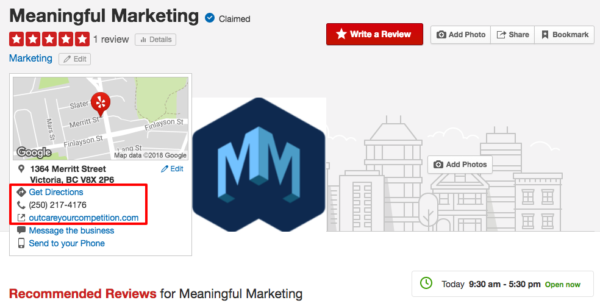 Regardless, this Yelp advertising review will help you determine if it makes sense for your business to advertise with them. A few of our clients and yourself want to know, is advertising with Yelp worth it? The answer depends on a few factors. Before I list the four questions you need to ask yourself to determine if Yelp advertising is worth it, here is how their advertising works. Since I’ve been in contact with a few Yelp sales reps, I’ve been able to acquire a link to their pricing and packages. Keep in mind that this link is for Canadian businesses. Another thing to keep in mind is that those prices are based on a 12 month contract. Now that you have an idea of costs, where your ads will be displayed? Yelp offers three areas where your ad will be displayed. You can see in the screenshot below that it’s pretty straightforward except for the “search results page”. The search results page is their “directory” of service providers or storefronts for specific search terms. We had one client advertise with Yelp and they’re an auto repair shop. So their ads were displayed on the Yelp directory for “auto repair shops in Victoria BC“. Since they also offer a few different services, their ad would be displayed on other search results pages for those other services. The competitor’s pages advertising is quite interesting and useful. People will find out about your competitors anyway. So if someone is viewing their Yelp listing, why not have your ad displayed there as well? Now that you know where the ads are displayed, you might wonder how your budget or PPC is determined. Each of the packages has a click budget per month. For our client, we choose the Intro Package and a budget of $275. 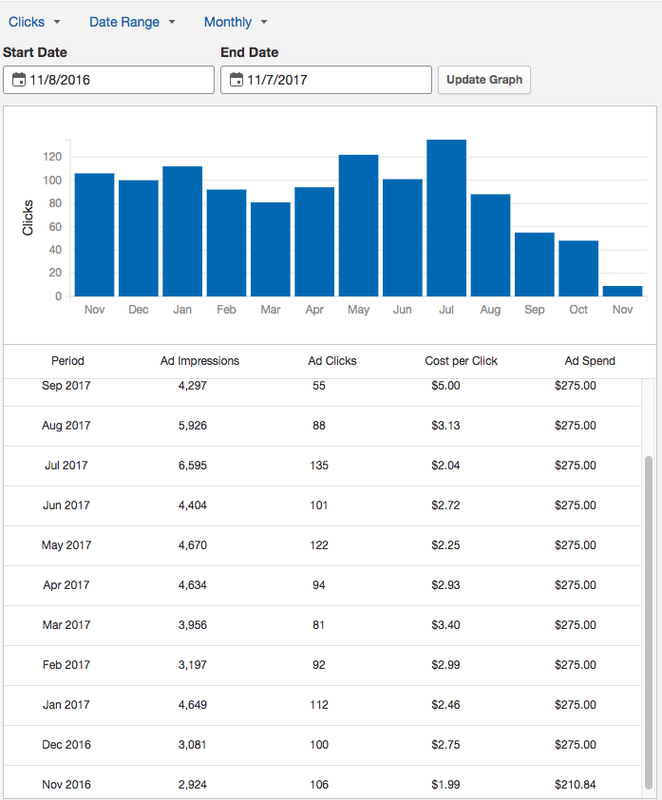 Within business owners dashboard, there is a section called “Yelp Ads” which allows you to see your CPC breakdown, amount of impressions and clicks. You can’t see how CPC is determined either and it varies each month. My guess is that they divide your budget for ad spend by how many ad clicks you received. What Are Ad Clicks & Leads? Of those four leads, you’re only going be really be able to track the visits to your website. Unless you use a call tracking number on your listing or have the call to action button directed to your site. With the call to action button, they suggest you have it set up to request a quote so people contact you directly from your Yelp listing. 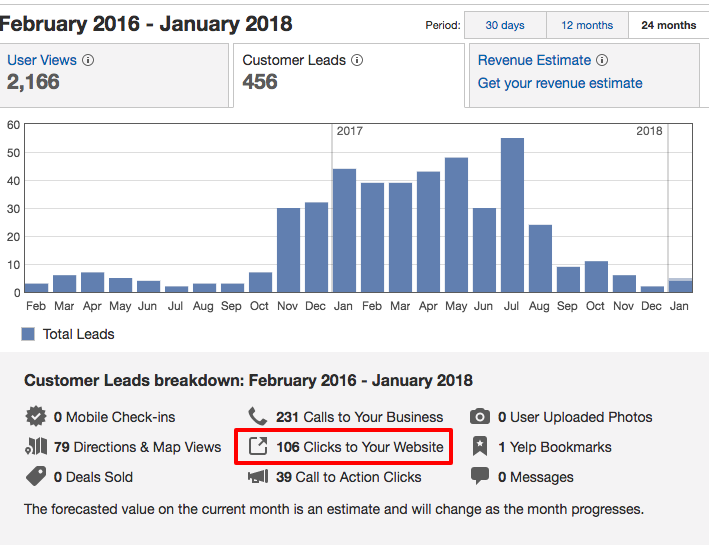 But with the website clicks, I don’t trust the number of leads from that metric and here’s evidence why. With our client, we were advertising from November 8th, 2016 to November 7th, 2017. Since Yelp’s dashboard doesn’t break down the number of leads by month, it’s tough to see what type of lead metric it was. Using the last 24 months as a reference though, we can see that we have 106 website clicks. That number doesn’t jive with our Google Analytics stats though. 106 to 59 is a big difference. The 106 website visits were taken over a 24 month period as well and we only advertised from 12 months. That’s quite a big discrepancy if you ask me and makes me question if the other lead metrics are legit. Another issue is how could we know if the leads were generated by our paid ad click or an organic one? There is no way to determine that. Surely we had generated a few leads from people visting our listing without us paying from them to get there. With all this in mind, let’s get down to the four questions you need to answer so you can determine if Yelp advertising will work for your business. 1) Do any Yelp directory pages show up in the search results ahead of your website? Yelp has done a good job with their SEO and trying to rank all of their directory pages. When you search for your targeted search terms in Google or Bing does a Yelp listing show up ahead of your website? 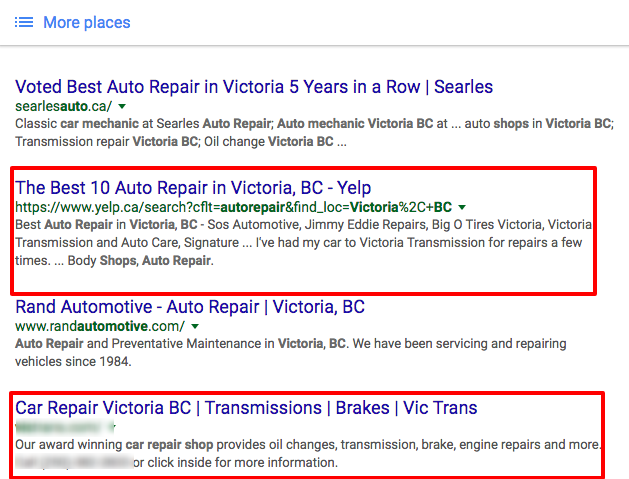 In the screenshot above, it might worth it for our client who is listed two spots below the Yelp directory listing for “auto repair Victoria BC”. When you search for your products or services, where does the Yelp listings show in the search rankings compared to your website? If it’s quite a few or even two spots ahead, it might be worth going with Yelp. 2) Do you have a lot of competition? This question is related to the last one. If you have a lot of competition and you’re not ranking very high in the search results, then you can leverage the traffic from the Yelp directory listing that ranks high. 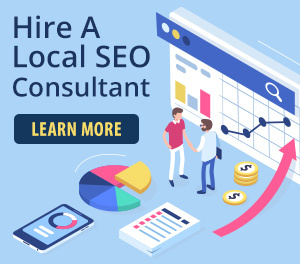 The money spent on local SEO and trying to get better rankings might be better spent on Yelp advertising as you will see more traffic directly. This is especially true if you have a lot of competitors and your website is ranking on the fourth page and beyond. But this money could also be spent on Google Adwords. I’ll cover Adwords vs Yelp in a bit. 3) How many views does your Yelp listing receive right now? So a view can come from someone seeing your listing in a directory and be viewing your actual listing page. It would be really nice for Yelp to separate the two, as someone viewing your listing directly is far more valuable. If your listing is getting a fair amount of user views, that number would increase significantly if lots of people are searching through a search engine for your product and landing on a few different Yelp directories. It would also increase if people bypass Bing and Google and head to Yelp and do their searching there. Unfortunately, Yelp doesn’t have stats for how many users view a directory like their “auto repair shops in Victoria BC“. This would make the decision much easier. So, for now, we’ll have to go off how many user views your listing gets. 4) How many products or services do you offer? The more products or services offered, the more Yelp directories there will be. If you are an auto repair shop, you most likely offer brake repair, oil changes, tires & suspensions and more. In this case, Yelp will have a directory for each service. This would then increase the number of views your listing has. You would have to ask the question to your Sales rep how a budget gets divided if you offer different services. In the case of the auto repair shop I’ve mentioned, this screenshot below shows the increase in user views during the 12 month advertising period. On the other side of this is if you’re a massage therapist that only offers that one service, you will only have one Yelp directory. This would mean your listing might not have as many views. Answering the questions above will you decide. But I want to toss another option at you that you probably are already aware of, if not using right now. The first question I asked above had to do with the Yelp directory listing and it’s search rankings. The idea of levering Yelp’s SEO and search rankings is an easier way to get targeted traffic to your Yelp listing. But Google Adwords is an even better way as Google Ads will appear at the very top of the search results. There are lots of studies floating around in regards to the percentage of people who click on the Google Ads at the top. I’ve seen 20-35% click on the ads while the other 65-80% goes to the Google My Business (maps results with 3 businesses listed) and organic search results. The 65-80% could then come across a Yelp directory for your business’ products or services in the organic results. This coupled with the fact the Google Adwords CPC is going to be higher then the Yelp Ads might make Yelp a better option. With that being said, if you do advertise using Google Adwords people are directly visiting your site. 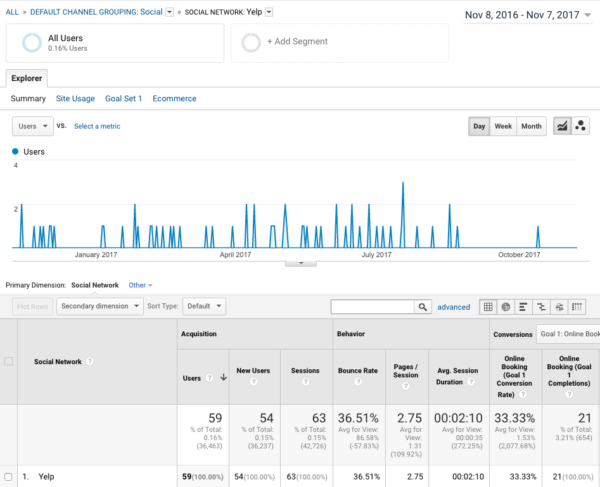 I’m a big believer in driving people to your website as you can control the flow of the visitors and see the Google Analytics stats and track things better. If you advertise with Yelp, they want to drive people to your Yelp listing. You then have to rely on people clicking on your website link to see your website. It seems to be the case from analyzing a few clients’ Yelp ads that most people call the business rather than visit the website. This is good, however, as you want people to call you after they reach your website anyways. They just miss out on learning more about your business. But they’ve called and that’s a major goal in any business. So Is Yelp Advertising Worth It? After all this, it comes down to answering the four questions above. At that point, you should have a good idea if it’s worthwhile to spend the money and advertise with Yelp. Obviously, I would be cautious of the 12 month contract, but thankfully you can jump in between packages. If you do decide to advertise with Yelp, it will be a far better option than going with Yellow Pages Online. YP is very expensive compared to Yelp, but Yelp’s SEO and local search rankings are better than YP’s. If you have any questions regarding Yelp or SEO, contact us today and we’d be happy to consult with you.